I saw that some people suggested adding boots to the book tour clothing. They might look lovely, but I have enough trouble packing shoes! I wouldn't want to have to deal with packing boots! I also made the mistake of taking a warm coat on an extended trip. I would have done fine with a windbreaker over a sweater. I think your choices are well worth considering for my daily wardrobe. I'm late weighing in on this post, I know, but I was reviewing the book tour suggestions today and noticed the little open book icons as dividers between the outfits. How cute is that? This is another practical but lovely travel wardrobe. Thanks, Janice! And best wishes to Tish on her tour. I'm looking forward to reading her book as well! 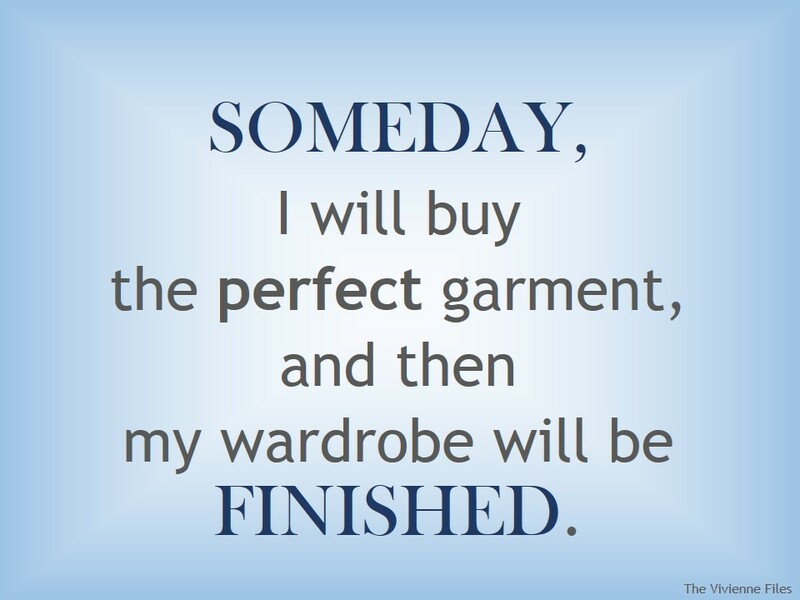 Fashion Fairy Tale #1…oh too true for me! Your post over there is fantastic–as always. Love the fairy tale too–I think we all get caught up in that. Oh how I used to believe in this fairy tale. It took realizing, thanks your your blog, that one of my personal closet priorities was that I wore 100% of my wardrobe regularly, with *reasonable* allowances for seasonal and special event clothing. That made me realize that if my closet reflected my priorities that something would always be getting worn out or damaged from everyday wear so now dream of an organized system for filling wardrobe holes instead. Getting close. Can you give the correct corollary to this Fairy Tale? I know that items wear out, but where do you draw the line between a wardrobe with which you are satisfied and constantly shopping and looking for another garment? I have had a gold silk skirt for over 10 ten years, and while I have worn it with a black top and some other basics, what I really wanted was a gold flecked sweater. I finally found one that I love last winter. I feel like that part of my wardrobe is pretty "complete" now (the sweater goes with a lot of other things I have too). Because of the sweater, I will most definitely wear the skirt more, so yes they will eventually wear out, and I will replace them with another skirt and sweater, but that is a few years down the road, and I probably won't even be looking for something gold at that time as I will be happy to move on to something else beautiful I find. Please explain more what you mean (for beginners 101 like me that need a little more hand holding). I think the better way to think about a wardrobe is similar to how you think about groceries – you buy them – make sure you have enough for the next few days, you use them, they're used up, and then they're replaced. Oh how I can relate to this. I have had an ongoing list for years because I rarely find the right item at the price point I've set for myself, add to that my forever fluctuating weight! I'm so tired of hunting and so very tired of my list. Oh, I didn't see it as a perfect garment from a list – I saw it as meaning that someday a garment I had bought at random would turn out to be the perfect missing link. Of course, since I don't know what that garment is, I have to keep buying the things that catch my eye, in the hope that one of them will turn out to be 'it'. Which is of course why I keep (or 'have kept' – since I am gradually being re-educated by Janice) shopping …… Guilty as charged, m'lud! I come very close to finding some perfect garments, sometime. The trouble is, they don't last forever. I miss some of them that have been gone for years. In the meantime, I have to put up with some very imperfect things. BTW, do you have any recommendations for casual pants that can be worn around the house, or out to the grocery store, and will be comfy? I have these awful White Stag brand khaki-type things that I bought before I lost 30 lbs. I often end up in sweats around the house, but sometimes they can be demoralizing. If you know what I mean. thanks, and thank you for this wonderful blog! I have been reading for a year now.